If you find annoying third-party advertisements and offers while browsing the web, Native Info may be the one to blame for them. This adware program is not a new invention; as a matter of fact, we have found that it is simply a new clone of Bronze Aid, Discovery App, High Stairs, Wander Burst, and many more useless applications that are based on the infamous Injekt engine. This program is no use to you at all; therefore, you should not keep it on your system. In fact, you should remove Native Info as soon as you realize it is there on your PC. This is an important step towards a clean and secure operating system because this adware may expose you to unsafe third-party web content. Through such content you may access malicious websites and infect your computer with more threats. Please continue reading our article to find out more about this malware and how it can risk your virtual security. “The site ahead contains harmful programs” is what you will read on a warning red background if you try to visit the promotional page of this useless application at UseNativeInfo.com. At least, this is how an up-to-date Google Chrome browser reacts when you want to load this page. Similar reaction is generated by Mozilla Firefox, which redirects you instantly to a warning page that is entitled “Reported Unwanted Software Page.” This should definitely help you to know whether this program is reliable or not. But, even if you could access this page, you would not find any useful information there. “For information when you need it, get Native Info” is all there is to read on this rather simple page, which is quite vague to say the least. There is no download button, but, instead, you can click on a “Learn more Today!” link that loads a contact form. It is most likely that no one has ever downloaded this adware from this source. We have found that this application is mostly distributed in freeware bundles. However, these software packages can be packed with a number of malicious installers. Therefore, it is quite possible that apart from a target free program you also download and install several infections, such as adware programs, browser hijackers, and potentially unwanted programs as well. It is possible to download such malicious bundles through suspicious websites, including torrent and freeware sites. That is why it is important for you to be very careful when you are searching for free stuff on the web. If you are not experienced enough, you may easily end up on one of the fake file-sharing sites that promote a lot of unreliable third-party content. These pages are usually full of annoying advertisements, but some of them you can hardly distinguish from the real content of the page. If you are on an unfamiliar site, it is really not that difficult to click on content that results in downloading an infected bundle onto your computer. If you are in doubt as to your malware situation, we advise you to remove Native Info right now and run a malware scanner to detect all other potential threats as well. This adware is very similar to the members of the well-known SuperWeb ad-supported family. It displays potentially harmful and also annoying third-party ads, pop-up commercials, and offers. These can ruin your browsing experience, but they can also present a security threat. The third parties whose advertisements are promoted by this adware are not controlled or reviewed so practically anyone can pose as a third party. This way, cyber criminals may also hide behind even targeted and customized advertisements to draw your attention. One single click is enough for you to end up on a malicious website where all kinds of bad things may happen. For example, you may be tricked into downloading some “urgent” driver update, which infects your computer with more malware programs. But you may also find yourself on a fake online shop page thinking that you are buying your long wanted product for a very cheap price, but, instead, you simply give up your personal and banking details to criminals. We do not think that any of these scenarios are on your bucket list; therefore, we believe that you should delete Native Info as soon as possible. It is really not that difficult to clean your computer of this adware. We can offer you two options. If you are not an experienced computer user, you can simply locate the uninstaller and run it through Control Panel. But, if you are more experienced and would like to manually eliminate this threat source, we can offer you our manual removal instructions as well. Please follow our guide below, if you need any assistance. It is important not to forget about the other threats that may be hiding on your computer because until you get rid of them all, your PC will not be secure. You should keep all your programs and drivers regularly updated in order to make it more difficult for cyber criminals to find a security hole to access your data. If you want to protect your computer properly from all malware infections, we recommend that you use a reliable anti-malware program. Select the uninstaller and press Remove. Tap Win+R and type in Control Panel. Hit OK. Select the uninstaller and press Uninstall. Tap Win+Q and type in Uninstall a program. Press Win+R and type in regedit. Go to %AppData%\Mozilla\Firefox\Profiles and open the profile folder. 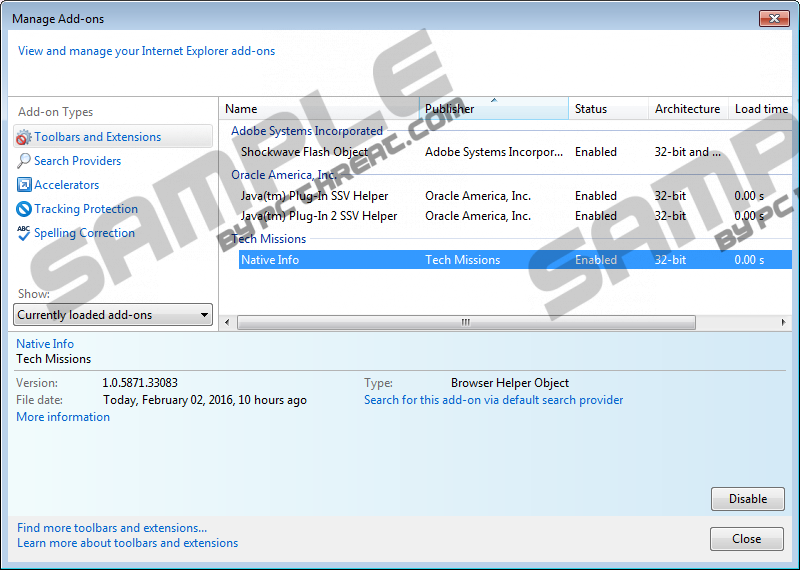 Access the “extensions” folder and remove firefox@www.UseNativeInfo.com.xpi. Quick & tested solution for Native Info removal.